- The quail families that live under the big fir tree. The way they walk fast - always walking - in a line - father, mother, babies - with their the little thing on their heads bobbing. Watching the babies from May and June grow. Seeing them get fat. - The cherry trees in our yard that produced red gorgeous fruit in July. - The back yard patio that welcomed friends and family for numerous dinner parties throughout the summer, culminating in the giant cook out the day before our wedding. - Discovering that the strange apple trees in the yard aren't crab apples - they really are good to eat. - Discovering a small pear tree that bore several very large and delicious green pears. - The view of the side yard from my office window, where I work every day, where I can see the cherry and apple trees, and can now see the leaves changing colors and the mountains in the distance. - The lavender that has grown in the front yard from May until now. I wore it in my hair at our wedding. 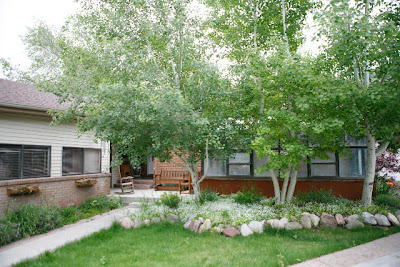 - The sound of the wind rustling through the small Aspens by our front porch. It might be one of my favorite sounds.